Poverty is not random, inevitable, or the fault of poor people – it exists because of injustice. The fact that 1.2 billion people live in extreme poverty is an injustice caused by inequality – especially gender inequality and unequal power relations. 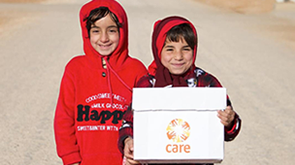 CARE believes that all people, everywhere in the world, have the right to a life of dignity. This means a life free from poverty, violence, discrimination or human rights violations. It means a world where all people are included in society, and all people can claim their rights to health care, shelter and education regardless of how poor or rich they are. That’s why all CARE’s programmes support poor people and communities to fight the injustice, inequality and lack of rights that prevent so many people around the world from fulfilling their potential. Globally, of the 1.2 billion people who live in extreme poverty, the majority are women and girls. Over a quarter of a million women die each year from largely preventable causes related to pregnancy and childbirth. On average, greater numbers of women and girls die during and after natural disasters than men, and in situations of conflict or political unrest they are extremely vulnerable to sexual violence. Women play leading roles in food production and preparation, but in many places they consume the poorest quality food and are the first to face hunger when food is scarce. Despite contributing a large share of agricultural labour, women own a tiny fraction of farming land, and have less say than men over decisions and less control over household resources. Addressing the social inequality that underlies poverty – especially gender inequality – is crucial to fighting and ending poverty. That’s why CARE focuses on empowering women and girls. But it’s not just a women’s issue – it’s a matter of human rights. So we also work with men and boys to support them to be champions of change: because with awareness-raising training and support, men and boys can see the justice of changing the attitudes and the power structures that perpetuate gender inequality and cause the injustice of poverty.